Wall makeover estimate: How much to clad or tile a wall? 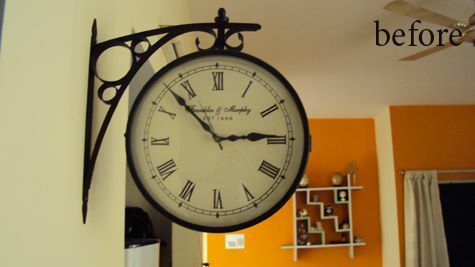 This week I’m going to showcase some inexpensive projects done around the house. We’ll cap it with a easy, DIY project on Friday. If you remember, I’d spoken about wall cladding a while ago. The project, in itself, was easy to get done, but making the decision was hard. We went back and forth choosing the tiles, questioning often if it go well with the new paint color or not. Of course, if you don’t intend to re-paint anytime soon, it might be easy for you to decide. 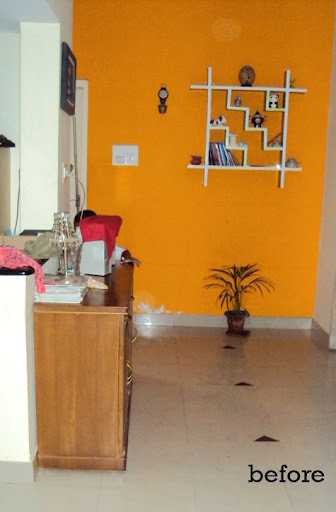 Initially, we were inclined to clad the walls perpendicular to the orange one as it is in the line of sight from the main door in an earthy palette or render it a stoned look. After multiple trials and combinations that stretched into weeks, we settled on this offbeat tile from Somany. 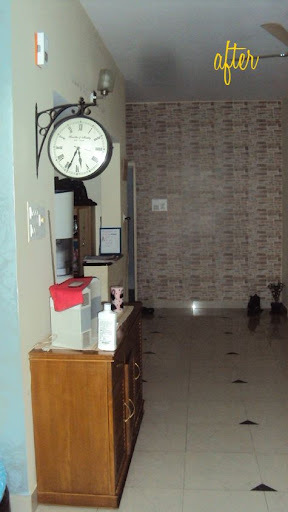 In retrospect, the grey, earthy tile that we had selected initially would have geled well with the Asian Paints Surprise your spouse wall color. But, what’s the point of an accent wall then, right? This is in progress where the wall is chipped closely so that the tiles can be cemented. The wall took about 3.5 hours to clad from start to finish. Chipping, cementing and finally grouting. It’s about 72 sq.ft in area. Now, coming to costing. 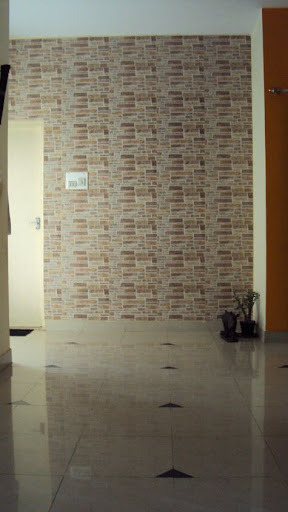 Wall tiles start from Rs. 28 per sq.ft and go all the way up to Rs. 130 sq.ft. 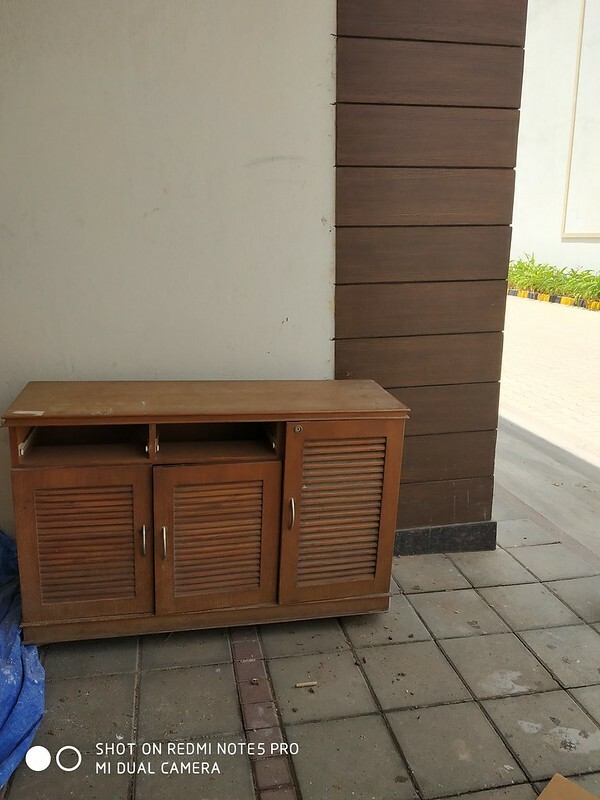 The ones we chose are from Somany (Rs.57 per sq.ft) and come in boxes of 1 pieces each. The tile is 16*12 inches in dimension. If you are choosing local brands, it’s possible to get single pieces and not be forced to buy the entire box. So, that was about Rs.4,100. Labor cost for laying is usually Rs.10-12 per sq.ft but since this was a small area, they charged Rs.1,100. In all the project cost came to Rs.5,200. The choices are umpteen so if you are thinking of painting your home this festive season, throw in a cladded wall into the mix and you’ll be glad with the results. 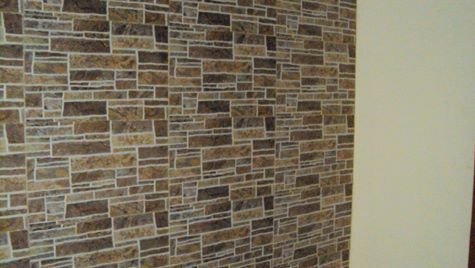 Tiling a feature wall does take lot of courage to decide on esp considering it limits the options that you may have wrt what you may want to do with the wall at a later time… But definitely adds much more worth to the wall l… Good choice of tiles… Loved the look. We still have white walls in all the rooms and are still not having the courage to texture one of them… Part of a long term plan I guess ! Am a lil surprised though about the labor cost…10-12 seems quite on a lower side… When we did counter wall tiling in the kitchen, we had to shell out 50 per sq ft (in chennai) for 35-40 sq. feet of tile laying. Somu: I think 35-40 is on the higher side, as this would be close to the cost of each tile in many cases. I definitely don’t think it’s that high for any kind of tiles in Bangalore. Anyone here who has got other walls re-tiled? I’m going primarily with white this time for walls except one wall in two bed rooms. Thanks, Pat. I know you are inclined towards orange and infact thought of you as I put up those before pictures. Awesome, the wall looks really neat! I am surprised that the job was done in 3.5 hours. Who did you get it done from? Yeah seems like it… Maybe now I can negotiate better… When we built our home… we were quite unaware of actual rates ! Local talents sure are amazing !!! 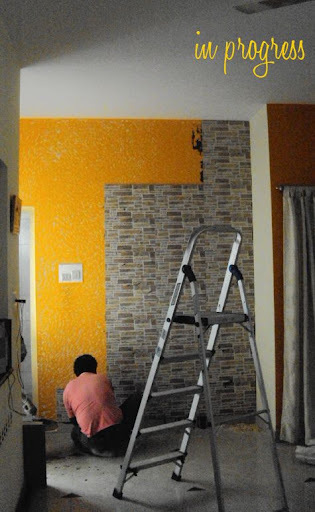 Hi, we were planning to clad our living room wall and post seeing your article ( which finally made us decide on it :) ) we went to somany. But they really didnt have any tile for Rs. 57 per sq ft. They were showing us stuff for RS 165 etc Could you tell me the name of the tile you have used so i can go back and enquire? Would love to hear from you. Neha: Nice to know. Can’t really recollect (rather don’t think I ever asked the name) for this design. If you live in Bangalore, I can tell you where you can pick the same one from. Laksh, can you please publish the details of vendor from where I can get stone tiles in Bangalore? Laksh, can you please share the details of vendor from where you purchased stone tiles in Bangalore?